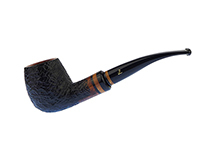 Milan Tobacconists offers a wide selection of fine pipes, such as the Lorenzetti briar pipes shown below, for the discerning smoker at reasonable prices. If you are unable to easily locate a particular tobacco pipe, please give us a call at 877.70MILAN or send an email to customercare@milantobacco.com. We'll do our best to make a match! The Lorenzetti Pipe family business was founded in 1934 by Otello Lorenzetti in the Italian province of Macerata with nothing more than a few rented tools and his own skilled hands. Otello, wife Marinella, and their children Luciano, Gabriella, and Alessandro grew the business into the successful company it is today through the acquisition of quality briar, the family's great attention to detail, and a collective passion for the art of pipe making. Lorenzetti Pipe is still located in Macerata and currently managed by Alessandro, Otello and Marinella's youngest offspring. We are pleased to offer these briar pipes from Lorenzetti's Emperor Series, which are named after historically significant Roman emperors. Click on any link or image below to view all of the available pipe shapes in each of the Lorenzetti lines.